As of this morning, it has gotten down to -22 degrees fahrenheit with wind chills down to -49 degrees fahrenheit. You can see in the image above that it appears that tomorrow early am is going to be a couple of degrees colder. But, not sure it will break the record of -27 degrees - which happened during my lifetime in January of 1985. 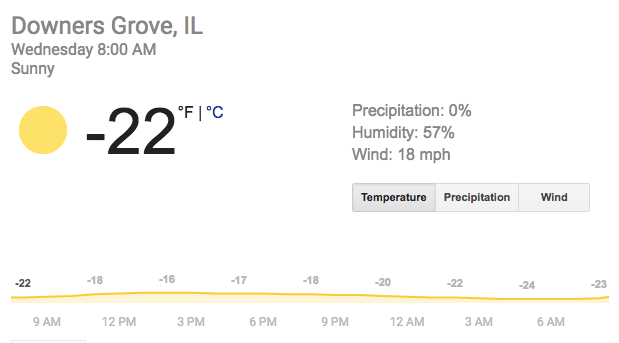 I don't have any memory of the cold of 1985, but I *do* have vivid memories of the Polar Vortex of 2014 that sat over Elmhurst (and all of Northern Illinois) for two days. It was cold those days, but not so cold that they shut down the mail. In fact, Nat spotted our mail carrier out delivering mail and invited him in to warm up. We had another smaller Polar Vortex in 2015 (I think it was classified as such??) and I posted about how we ended up with just a little bit of cabin fever and went outside to make a quick snow angel for like 4 minutes here on the blog. So...how cold is it today? The United States Postal Service has suspended mail delivery. The whole USPS motto of "...Neither snow nor rain nor heat nor gloom of night stays these couriers from the swift completion of their appointed rounds" gets thrown out when common sense gets inserted into the moment. Let's be honest...there isn't a pressing need for mail delivery today - especially for folks like us in Downers Grove where the mail carriers are carrying a bag on their shoulder, walking house-to-house delivering mail in boxes attached to houses. They're not riding around in one of those little cars with the steering wheel on the wrong side. Sanity prevailed and the Coupon Clipper can get delivered in a couple of days. We'll wait. Also, it is so cold that the garbage guys aren't picking up our trash today. Smart move. Our firewood delivery was postponed, too. No sense having the guys out on the trucks in this weather. They'd have to load the truck with wood, then try to deliver it today. We can wait. And...one of Downers Grove's "Warming Centers" - the public library - decided to close! Yep...a 'warming center' decided against opening. And, of course, school is closed for the kids. Oh, and my office is officially closed for the day to discourage anyone from actually trying to come into the Aon Center. So, we're working from home and monitoring the Nest app on my phone and computer closely to make sure our furnaces and fireplace stay on top of the temperature. Home office with sound-proofing FTW.